Alex Senka's fragile existence crumbles when he is dismissed from work. Young and desperate, his efforts to find meaning and seurity in another job serve as raw material for a story written by his neighbour. As Senka loses hold on life, he turns increasingly to the protagonist of the work-in-progress for hope and guidance. Fiction and reality meet and merge in a surreal climax. "A novel about the seductiveness of books and reading. Sonya Gore is a lover of books. The owner of a struggling second-hand bookshop, she is facing ruin when a terrible solution presents itself. Meanwhile, a series of mysterious short stories start to appear in odd places, written in the form of dialogues between historical figures such as Kafka and Hemingway, Moses and Marx. They are obviously meant for Sonya, but who is sending them, and why? Gradually, Sonya begins to see in the dialogues a key to her salvation. When the author finally reveals himself and a passionate affair develops, the wheels of disaster are set in motion. The twelfth dialogue promises a fatal end - or a new beginning." We are all, from first to last, bound to each other by a slender thread of breath passing through language and lung. In this inspired collection of stories - modern parables - the anonymous protagonist exists in a world that is at once private and public, familiar and alien, real and illusory. Sudden, heart-stopping events intrude with bizarre consequences. 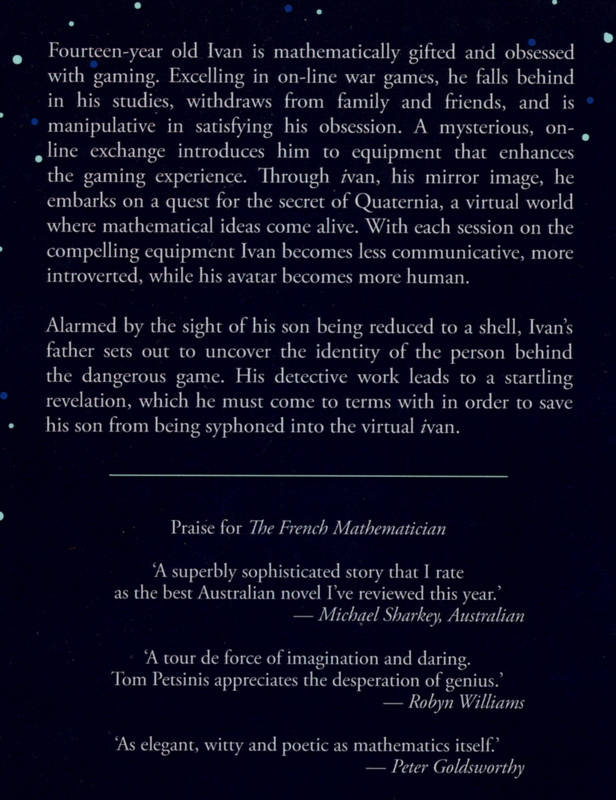 Plunging into a sea of numbers in search of the ultimate prime, a man struggles for his very existence; estranged from life while contemplating his masterpiece, an artist yearns to slip inside his work; a chanter of hymns retreats into the dessert to purify his voice, only to discover a dangerous silence. Spanning centuries and continents, these stories are driven by a relentless, often obsessive quest for meaning and identity. And the reader, pulled by the force of Petsinis's intensely powerful prose, is compelled to confront these same questions . . .
"The French mathematician is Evariste Galois, brilliant and tragic, whose work was dismissed by his contemporaries. A fervent Republican in post-Revolutionary France, Galois was imprisoned at the age of twenty and died a year later in a mysterious early-morning duel. Vivid in its depiction of a life in an age of Romanticism, this is a spirited, allusive and moving account of a young man caught in the tensions between history and the individual, order and choas, and genius and self-destructiveness."